Mazda CX-7 with the non-turbo 2.5 engine, but price may be an issue. I've had my 2011 since new with no problems except 2 recalls. Can't go wrong if it is properly maintained. 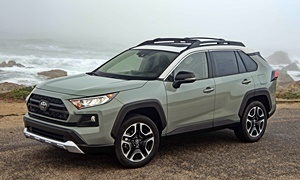 Are you looking for an SUV due to a need for AWD or is more of percieved size related safety factor? Unfortunately in your price range you won't be able to get any of the newest safety features but instead want to focus on crash test scores. As far as braking is concerned also consider the tires. An $6,500 used car likely may have tires that are down to their last 1/2 or less of tread. A really great all around tire at very reasonable cost General's Atimax RT43; it is available on Tire Rack in most sizes for under $100. Good options include Honda CRV, Toyota RAV4, Subuaru Forester or Imprezza. All are decent performers and reliable although none are perfect. Here is an interesting list from Insurance Institute for Highway Safety. It is a little dated but I think instructive for your price range. 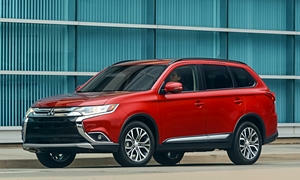 The sleeper of the above bunch is the Mitsu Outlander. Even though they have pretty reliable cars, Mitsu has never successfully competed with Honda, Toyota, & Subaru. Because they never sold well it can be hard to find much info on them. CR give the 2014 a 4 out of 5 reliablity rating. If you can find a good used one it would probably be significantly less than the others & worth considering. While pre-2010 Subarus have their fair share of head gasket & wheel bearing issues they tend to be pretty reliable beyond that. Older models seem to be everywhere here in W WA so they are not ending up in the junk yard, that's for sure! Idealy I'd try to find one that as had the wheel bearings & head gasket replaced within the past 30,000. Due to their popularity Subies tend command a premium price. The Kia/Hyundia twins are also a good bet, fairly plentiful, reliable, and reasonably priced. 87% of owners find it reliable. Brakes are an issue through 2013, otherwise pretty troublefree besides a slight issue with the dashboard interface controls in 2014. One of the most reliable cars in the list. 83% of owners find it reliable. Only issue is problems with the climate system and it is a consistent issue on cars from 2008 to 2013. You are better off with 2014 or later to avoid that issue if you can afford it, otherwise be prepared to spend money to fix that one issue. 52% find it reliable. Average to below average reliablity through 2013, you probably want to avoid this one in your price range. Climate system, suspension, brakes, paint and trim, in car electronics, and power equipment are all below average to some degree until 2014 when it gets better. 22% find it reliable. 2012 to 2015 are fairly reliable, terrible after that. So you are probably okay on those specific years. Some issues with the brakes in 2010 and 2011, 2010 and 11 has severe transmission issues, and 2011 has some body integrity issues - that is it. If you can get 2012 or later you are better off. 81% find it reliable. Unfortunately, this is one of Subaru's worst models with oil consumption issues. Consumer Reports reports severe engine problems on the 2008-2012 Subaru Forresters (all either one arrow down or two, two down is the worst rating). In 2013 and 2014 the engines go to slightly above average on severe engine problems, and 2015 on they are fine. Danlisahall and I respect each other but disagree very much on this issue. You can monitor the oil level and drive the car just fine, but the issue is real on this Subaru in particular. I own a 2013 Legacy, and I put oil in every 2000 miles but besides that it has been troublefree and is good in the snow. Brake and body integrity issues also exist on these models as they age. 81% find it reliable probably because 19% probably have the oil consumption issue (my guess honestly). I am one of the few with oil consumption who still think it is reliable, because I watch my oil level in all my cars (a good habit to have, but most don't do it). 61% find it reliable. I agree, 2011 or later as the earlier models are just terrible. Pain and trim and body integrity issues (rattles) are concerns but nothing really to worry about. It is actually a fairly solid car (maybe not the best to drive, but it will run a long time). No overall % on those finding it reliable. Avoid at all costs - worse in reliablity than the Vue you looked at. Worst below average rating all the way through 2015. Major issues with the engine, engine cooling, rough shifting problems, fuel system concerns, brake issues, body integrity problems, and electronic concerns. Honda Element2007 and later $8,900. 92% found it reliable. 2007 through 2011 (last year of production) are solid cars. 2007 have some transmission problems. and through 2008 they have drive system issues. 2009 have paint/trim concerns. 2010 and 2011 are your best bet for reliable trouble free models. 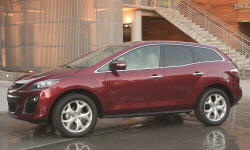 The Nissan Rouge as 62% found it to be reliable. A pretty good car from 2010 to 2013 if you avoid the year before and after that. Only 2012 has any issues to mention - Minor Transmission, brakes, climate system, trim and paint. That is it. The other years all systems are average or better. You probabaly can get this in your price range as well. One last car - which may surprise some on this board as some hate this brand but I am trying to be unbiased is the Chevy Equinox from 2013 on. Those cars in Consumer Reports survey are above average in every catagory from that year on except in car electronics some years which rate average. They are not exciting or the best driving, but they are durable and reliable. They are cheap too because the depreciate fairly quickly. However, avoid anything earlier as they have many quality lapses. Good job Norm on showing the IIHT crash ratings for each vehicle! I didn't intentially omit the RAV4 from list, rather it wasn't on IIHT's list - to my surprise. While it is helpful to point out the flaws / potential trouble areas of each model, perhaps the biggest challenge our OP is going run into is finding any of the above in decent shape in his year / mileage / price range. You and I, who perhaps are willing or able to spend more, can thumb our noses at those models which may use some oil or have body integrity issues (rattles). But for a parent with a fixed amount to spend for their teen, all the cars that meet the stated parameters are likely to have some concerns. Let's keep in mind the OP's original were "Powertrain performance / Safety & braking / Exterior styling".While I hope to be wrong, I think they are going to be looking at something south of 2012 - perhaps way south. The other issue is that reliablity ratings can be all over the place. The seem to be based on how the sampling is done, on owner perceptions and on the alignment of the stars. For example, here on True D the 2010-2012 Sante Fe has a rating of 98% vs the 2010-2011 (no data on 2012) Equinox with a worse 148% or 50% worse than the SF. The 2012-2017 Equinox has a 79% rating vs a 98% for the same years of SF - not a huge difference. Yet CR, which probably a larger base to draw from, has pretty signicantly different results. For reliablity I certainly will look at CR, TD's data, but I also look at actual owner reviews on sites such as Edmonds & Car.com. That takes a while but is worthwhile IMO. Last but not least, I pay a lot of attention to what the personal experiences are of actual owners I & how they car for their cars. For example, my daughter bought a used drove a late 90's Jetta to my dismay. She drove it for 6 years and over 200K, never had any issues! Go figure! I've helped select older, used cars for dozens of family and friends. My main criteria are the car's general reputation, experience of those I know, & most importantly, a reliable history. I always look for car that has the same owner for at least 2 years & ask for maintenance records. With some providence I often can find someone who has all the records & has already replaced the items that commonly go bad. They are just ready for a new ride. I'll drive 100 miles for that car! Buying used for a car over 5 yrs or 60K is an educated guess, a knowledgable mechanic's opinion, and lots of luck; and that is what I wish the OP. You are right it is going to be a lot of luck and mechanic's knowledge. I agree with all of your points in finding a used car. I do have my list of questions that I use for that situation but as you saw when I posted it before, it does not post well to this list so I won't do that again. Like I said, you picked well and I "liked" your presentation. You are right, I should have paid attention to pricing - the Equinox did not lose value as fast as I thought it would. Probably has something to do with it being one of the good cars that GM sells (like I said, quality is up and down around GM, but that is one of the good designs - shared with the Buick Envision). Sorry I did not see that. The thing I do like about CR is that if they don't get at least 50 cars, they don't list a rating. Here on TrueDelta I use the reliablity but I also understand that it has a lower qualifying number so a small number of people (is it 25?) can influence a reliablity. I do use it as well when buying a car but give it less value as a result. Different owners always rank cars differently but with 50 one owner does not influence it all that much. Only when the numbers grow to about 10 owners complaining about a problem does it severely impact their rating on Consumer Reports. Best bet I agree is the Mitsubishi Outlander as far as pricing goes. It is the cheapest for the lowest cost. But, they are not as cheap as I would have hoped. Near me, the cheapest one is $8500. It is just hard to find a car for that price in decent shape. It is going to be a crapshoot to get one. NormT, appreciate your humble response. "It is going to be a crapshoot to get one." My thought exactly. Anthony's goal of an inexpensive (< $6500) SUV for his teen) is laudable, it just may not be attainable - unless they are willing to accept a real beater and / or have some extra coin for repairs sooner or later. If he can up the ante to $7-10K, he has a fighting chance for an OK SUV. "It is just hard to find a car for that price in decent shape. "Actually I think getting a fairly good car for $6500 (or less) is doable, just not an SUV as they are simply too popular at this time. That is the reason I asked Anthony why he wanted an SUV. If he is willing to settle for a 6-10 yr old sedan or hatchback, then I think a good car, reasonably safe car is attainable for $6,500 or less. I suggest he take a look at the post just before his by Sforsyth ("diesel, 4 door, vw, safe") for some good options. No Rogues in my area for < $9999 & no 2013s at all. Humm, are they rare cause of their reliablity or were there not many sold in PNW? The one NormT found in CT has the right equipment (including highly desirable optional back up camera) and seems to have an exceptionally good price -- even has some sort of warranty. Could be the low priced SUV deal of the month. 1 star on Yelp:https://www.yelp.com/biz/a-better-way-wholesale-autos-naugatuck YIKES! Tip # 23, check out the dealer's rep and read the fine print before signing dotted line! By the way I am not Norm.... and I did not list the crash ratings for each vehicle as you stated. And picking out one dealer's bad review does not make it a bad SUV that model year. You may not like that Nissan suggestion, but the few I know people own they like them except that the older ones I mentioned are the ones not going to the shop (newer ones not that good at all). 1. I sorry that I referred to you my refering as NormT. 2. Sorry for my failure to realize that it was not AcuraT nor NormT but rather myself who provide the links to IIHT crash ratings -- sheesh!Obviously I shouldn't be posting so late at night! I agree that a bunch of bad dealer reviews (96 Yelp reviews with cumulative average of 1 star) doesn't make a particular car bad. I think your suggestion was great. It is just a heads up to be aware that A Better Way Wholesale in Naugatuck CT may not be the most scrupulous or easy dealer to work with. Danlisahall, thanks for the correction, much appreciated. You are right, the dealer is probably not a great one (and that also maybe why I could find such a good one for a low price). In any case, as I stated before, your list is a good one (and the Mazda suggestion above you is not bad either - but probably out of this price range). What is your zip code? We can look for good cars for you. With a low budget, it is better to look for cars that could be reliable because you don't have much of a selection and many old cars don't hold up. Everyone has given good responses so far. Your teen needs Electronic Stability Control, ABS, and Traction Control. ESC has been shown to reduce the fatality rate on the road by 50%. Advanced safety systems such as Automatic Emergency Braking are out of budget. Backup cameras are super helpful and could save them from some parking lot accidents. I suggest not getting an SUV for a first car, too. Expensive (inflated prices), not as good on gas, and they are harder to control for a new driver. To get a good deal on a car, be willing to drive 200 miles out of your way to get it. This is what you should set your search radius to. CR-V: 2007-2008 had door lock failures and premature tire wear. Something with how the wheel was shaped was causing the tire to wear I assume. 2009-2011 were better. 2002-2006 will probably be the best car if you want to stay under $6500. The only problem is the A/C compressor can go out. There are still many on the road, so that is also a good sign. 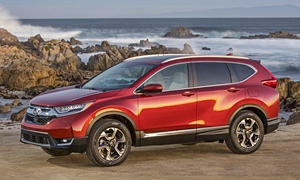 The CR-V was never subject to the Honda transmission problems like many of their other cars. RAV4: This one is iffy. 2006-2008 burned oil. No signs of problems yet, but will lead to engine damage later on. 2009-2018 have been perfect, probably your best bet but probably over budget. 2004-2005 were also great. 2001-2003 had a very bad transmission and should be avoided. Rogue: Just avoid all of them. The transmission failures are too common. They just aren't great to drive either. I'm renting a 2017 Nissan Pathfinder in Seattle with 30k miles right now. The CVT makes a grinding sound when accelerating at low speeds below 1200 RPM when uphill. Not a good sign of what is to come. The CVT issues apply to pretty much every Nissan with a CVT. I've never been a fan of Nissans, but I have nothing against them. When you buy a Nissan, you have to make sure it wasn't trashed during its possible life of being a rental car. Nissan went downhill ever since they partnered with Renault (or when they started using CVTs). Equinox: 2007-2009 was pretty good with a few issues. GM quality control wasn't up to par yet so only buy these if they are really good deals. 2010-2013 had a lot of timing chain failures, which is very bad. Avoid these. 2014 and newer have been very good. MPGs are lower in this one, but it is one of the heavier ones so it may hold up better in an accident. GMC Terrains are the same thing. Tucson/Sportage: Pretty much every year has been good until 2016. These can be found for cheap so I would take a look at these. 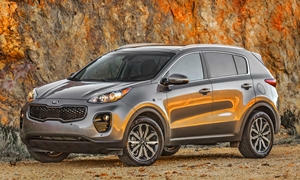 The Kia Sportage has the same problems, although it has been good almost every year. CX-5: Every year has been reliable since it came out in 2013. All are over your budget. Good and stylish car if you can afford it. 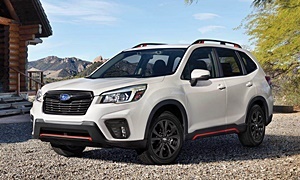 Forester: Wouldn't be my first choice because of oil consumption issues, but the other TrueDelta users can fill you in on what is good and bad with Subaru. Otherwise, it's a good car. CX-7: Not a reliable SUV. The timing chain is known to stretch and fall apart. I guess since this is a VVT engine, the entire engine needs to be replaced for $9k. The A/C compressor clutch also is known to jam and break the compressor. The turbo on the turbo models fails early because the turbo oil tends to run dry. $3k fix. Probably Mazda's worst car ever made. DON'T buy a Jeep, Ford Escape, Nissan Rogue, or VW Tiguan (repair costs and repair frequency). I know Jeeps are popular with teens but they are some of the worst first cars. 2010 Kia Sportage LX Manual Transmission- Only buy if you really like it. It probably won't be as reliable as the others. 2009 Pontiac Torrent 2WD- Well taken care of, but not as reliable as the Honda or Toyota. If it were my teen I'd be calling the private owner with the Kia & teaching my teen how to drive a manual - good for character development! It is reasonably well equipped including ABS, traction / stability control, acceptable crash test results, AWD (could come in handy in MI) lowest amount of miles & years, sounds reasonably well maintained (how many years has owner had it & what has he replaced - if anything?). It has a timing chain so you won't need to worry about changing a timing belt. AND its $500 under your budget so you got some reserve for repairs if needed. Primary downside is that it has a 4 cylinder which means it will be pooky to merge onto highway, especially if loaded. With some good negotiating skills you may be able to get another $500 off. 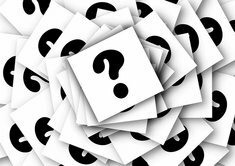 I ask a few questions, get a car fax to make sure it hasn't had any bad accidents if got satsifactory answers to those, my last question would be how long have you had it for sale? If it has been at least a week I'd offer $5,500 with good mechanical inspection - ideally at a Kia dealer if there is one near by (costs $100-$150).